The Spectacled Avenger: Administrative Unlaw? This is not a court. I recently read a newish book by Philip Hamburger called Is Administrative Law Unlawful? (Chicago: University of Chicago Press, 2014). The book is one in an ever-growing genre of roughly libertarian legal studies that defend a position that public law (in most cases specifically “administrative law”) as it is practiced today is either (i) degenerate law, or (ii) not really law at all. Usually these claims go along with an implicit or explicit claim that only the common law is “real” law — along with the US Constitution (as interpreted by originalists), if the writer happens to be American. The genre is not a new one. I have more than once in this blog cited Lord Bury’s The New Despotism (1929) with approval. And I openly admit to being in sympathy with the idea that state action, in the guise of “administrative law”, tends towards overexpansion and poses a threat to liberty. However, when one descends to details, it is more difficult to say why administrative law is so different from other kinds of law in a way that makes it more dangerous/ illegitimate/ arbitrary or less law-like than common law and constitutional law. Often it is argued that administrative law is a creature of executive power, and hence dangerous. But in a sense all law is the creature of executive power, at least insofar as laws require an executive for their enforcement. When the executive decides to neglect the enforcement of laws duly passed, this too is a form of arbitrary “tyranny” in which the executive usurps authority from the legislature. And yet this phenomenon curiously gets ignored by libertarians, though it happens all the time. My point is that, upon reflection, it is not always easy to draw a nice clear line between “executive” and “legislature”. Furthermore, consider this: If it was a mistake for the elected legislature to have created such administrative bodies or to have delegated law-making authority to them, then who is to blame for this evil? Clearly the elected legislature. Which perhaps ought to make us wonder why we should hold these elected legislatures in such reverence. Clearly articulating what is bad about administrative law is not as easy as many libertarian types would have us believe. I would like to present two more illustrations of this point, drawn from claims in Hamburger’s book. Hamburger’s point here raises a problem for his own larger position: If constitutional law arose as a reaction to administrative law, then the latter predates the former. Administrative law certainly predates any particular constitution that Hamburger is talking about — at least given his narrow definition of “constitution” as a form of government resulting from consent/agreement of the people (see p. 44). And yet throughout his book he relies on constitutional legal thought to undercut administrative law. He expects us to take for granted that the US Constitution acts as some kind of trump wherever it runs up against a practice, while he hasn’t really even bothered to defend this position. He is therefore begging the question. You can’t argue for the primacy or normative authority of constitutional law over administrative law by simply assuming the primacy of constitutional law. This is especially the case where it is open for one to argue at the very least that (i) administrative law is in many cases expedient and useful, and (ii) as a kind of law-making authority it pre-existed constitutional law. However, to my mind, there is a deeper flaw in Hamburger’s book, and in most books like it. Hamburger has a tendency to slip back and forth between constitutional law and common law as if they’re somehow synonymous. They are not (especially, again, given his narrow view of “constitution”). There is almost nothing in the US Constitution that an Englishman living in the Middle Ages (the heyday of the common law) would find intelligible. As it stands, this would just be a criticism about his loose use of language. But it has deeper ramifications. Hamburger offers a potted history of administrative law and its relation to common law and the rise of constitutional law that is very selective, to say the least. For one thing, it only really covers developments from the Tudors on. This is problematic, because if he were to go further back, for example if he were to read Pollock and Maitland on English law before Edward I, he would find that the common law itself is mostly a creature of administration: the common law system of courts, etc. was created by the executive to solve administrative/ governmental problems. And what was the exchequer court but an administrative body? Yet it was considered a common law court. Therefore, historically, common law is (or at least was) administrative law. The very term “common” law derives from the fact that it was the law as applied in all the King’s courts across the land, in what was a blatant usurpation of the local authority of his barons. In that sense the introduction of the common law was possibly the most audacious and far-reaching encroachment of state power in the history of the English-speaking peoples. In the beginning, all law was administrative law. And perhaps it is still so to a greater degree than we care to imagine. Finally, Hamburger’s focus on post-Tudor developments leads him to overplay the role of Parliament (and hence elected legislatures) in the creation of law. 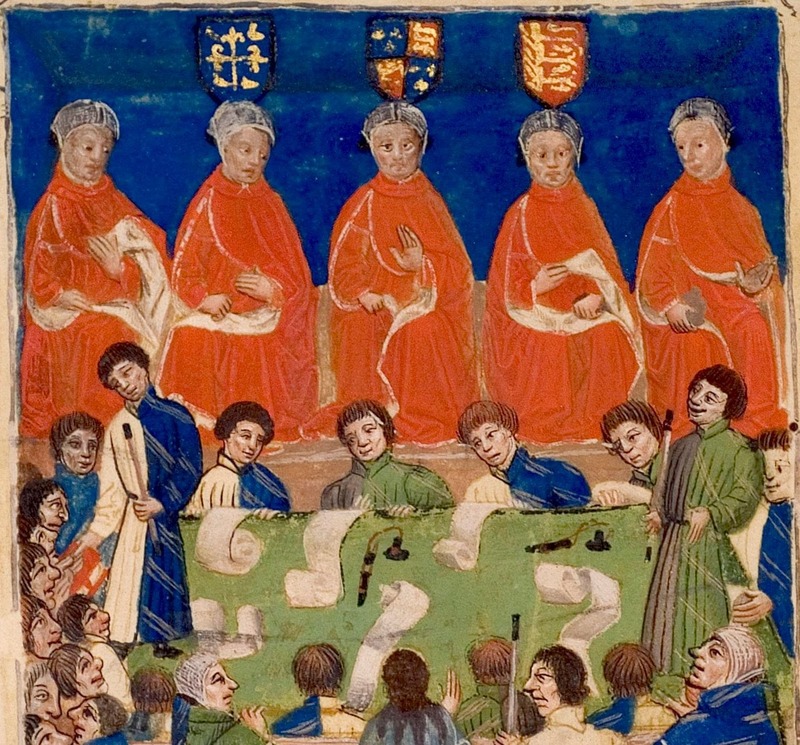 In the first formative period of the common law, “parliament” would largely have consisted of what we call the House of Lords, in which there was no popular representation or participation. Even a little later, when the commons were allowed some representation, Parliament was essentially an advisory body, not a legislative one. Does that mean that there was no such thing as law in England before the struggles of the 17th century? Or that there was no constitution? The claim would be absurd, but it follows from just about everything Hamburger is arguing in this book.